1 Feel the back of your neck. The bones at the back of your neck are connected to small bones all the way down the middle of your back. These bones make up your backbone. Scientists put all animals into two large groups. One group is animals with backbones. The other group is animals without backbones. 2 Animals without backbones are called invertebrates. Scientists estimate that 97 percent of all animals are invertebrates. They are found almost everywhere on Earth, living in oceans or freshwater ponds, living above the ground or under the ground. 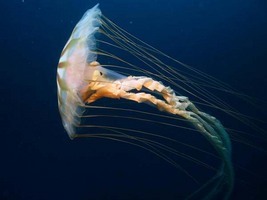 Invertebrates can be very tiny, like zooplankton, which are smaller than the head of a pin. Invertebrates can be very big, like the giant squid, which can be more than 30 feet long. 3 Insects are the biggest group of invertebrates. An insect's body has three parts: a head, a thorax, and an abdomen. An insect has an exoskeleton, or outer covering, to protect its body. The exoskeleton can't get bigger. When an insect grows, it has to grow a new exoskeleton and shed the old one.